11 Aug 2018 – Text by Paola Catapano. 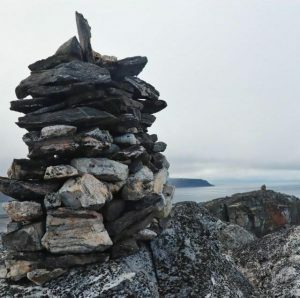 Cairns, left by Airship ITALIA survivors, discovered by the Polarquest crew. Once you leave the Spitsberg island, the largest of the archipelago, for The North East island, or Nordaustlandet, everything changes. It is remarkably colder than it is on these coasts, out of the reach of the warm Gulf Stream. We sleep dressed in our sleeping bags and our stays on land are much shorter. We are much more lonely now – no more royal yachts or huge tourist cruisers. Not a single sign of humans in sight, except for the omnipresent plastic shreds (we found a fully whole straw on Kapp Rubin beach today!!). Out here, there are only colonies of walruses fighting among each other, seals playing hide and seek with Nanuq from the rim of the water, and endless birds. Land is also different, with barren grey or granite white desolate beaches and ragged mountains piercing the very little snow here and there. From now on, every single topographic name of a fjord, bay, island or sound bring our crew back to the times of Nobile and his ill-fated polar mission. Alpinioya, Albertinibukta, Sora-viglieriberget, Finnmallmgrenfjord, Tandbergoya, Kapp Laura… The entire coast, starting from the Northwest corner of the Spitsbergen island to the Easternmost piece of land known then as Kapp Leigh-Smith and today as Raschoya, was the theatre of a number of courageous land rescue operations. Today we explored on land and by drone Kapp Rubin and Nordkapp, where Italian alpine rescue teams set their base camps to start searching for the team of survivors, Zappi, Mariano and Malmgrem, who had left the Red Tent to walk to land on pack ice. After exploring the Rijpfjorden, where we are anchored right now, Alpine corps Captain Albertini, together with Matteoda, Nois and Tandberg, set off on dog sleds to look for the 3 survivors who were walking on the drifting ice. The so-called “Albertini group” built cairns in strategic points visible from the ice, along the logical route they assumed the three missing crew members would have followed. We found two of these cairns on top of Nordkapp, took aerial pictures of them and their position. But we lost our drone on its way back. Its GPS has been very much influenced by the magnetic North pole nearby and we lost contact during its return flight. Now a party of 6 from Nanuq is on land searching for it while the rest of us are studying the maps to decide our next exploration area. Our reference expert, Stefano Poli, who suggested we reach Kapp Platen, where another alpine Captain, Gennaro Sora, together with the Dutch born engineer Sijf Van Dongen, set their base camp before reaching on skis and dog sled the famed islands of Foyn and Broch, which the Red Tent survivors constantly saw appearing on their horizon while they were floating on the drifting ice. The Polarquest team will soon be headed to the crash site of Airship ITALIA. While we await the conclusion of this expedition – keep track of Nanuq’s position, using the live tracker above!